Catholicism is rooted in the teachings of Jesus Christ and the coming of the Holy Spirit upon the apostles. Our Lady Queen of Peace believes in these early teachings and has built its foundations on Christ’s call and love. Find out more about our mission and our history. On a June evening in 1945, six couples met on the abandoned Westmorland Golf Course to look at the site. The west side of Madison needed a church, and the site was a good one. Two representatives went to Milwaukee, as Madison was then part of that Archdiocese, to request that Archbishop Moses Kiley establish a church. Archbishop Kiley agreed, on the condition that 300 Catholics west of Franklin Avenue would pledge $300 each. Six men went door-to-door and soon reached their goal. In the fall of 1945, the Archdiocese acquired 5.5 acres of the former golf course as the site. Archbishop Kiley established the new parish in November and appointed Father Bernard R. Doyle as its first pastor. Fr. Doyle assumed his duties on December 12, 1945, and Our Lady Queen of Peace (OLQP), with a membership of 318 families, became the first new parish in Madison in over 20 years. Fr. Doyle’s life came to an abrupt end on October 16, 1947, in a tragic auto accident. He left his legacy: the hope of a budding Catholic parish. On November 21, 1947, Bishop O’Connor appointed Father Francis L. McDonnell to shepherd the grieving community. With time, wounds healed and progress continued. 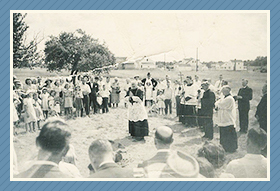 In July 1948, Bishop O’Connor joined the OLQP community to break ground for the first building—a school. The cornerstone was laid in December, and the school opened in the fall of 1949, staffed by the Dominican Sisters of Sinsinawa, an order founded by Blessed Samuel Mazzuchelli. Masses were temporarily held in the school basement until Monsignor McDonnell broke ground on the second building, the new church, on June 20, 1954. Based on a European plan, the architectural firm of Weiler and Strang designed it in a fan shape, both to focus on parishioners’ attention on the altar and to accommodate parish growth. Queen of Peace parishioners invested their hearts and hopes for the future in the $480,000 church. By the end of 1956, OLQP served more than 1,000 families, and 515 families attended the school. The third building was completed that November, and the priests moved into the new rectory. OLQP was the spiritual home of 1,700 families by 1959, and a fourth building, a convent, opened for the Dominican sisters. After 14 years, the dream of a visionary priest and the founding 318 families was now a completed campus. In March of 1969, the parish closed another chapter; after undergoing heart surgery in February, Msgr. McDonnell died on St. Patrick’s Day. The Wisconsin State Journal said of McDonnell, “He was devoted to his parish and was the vital force in developing it into one of the strongest, most active and progressive in the diocese…” Although the passing of Msgr. McDonnell left a large void, Father Schumacher stepped in as interim administrator until Bishop O’Donnell named Father Edward J. Erbe as McDonnell’s successor. Familiar with Madison and the heritage of OLQP, Fr. Erbe boldly carried the parish community into the next decade. In 1979, the parish updated the sanctuary to meet Vatican II guidelines, also installing a $100,000, 40-rank Schantz pipe organ in 1980. In 1984, Dr. Jane Lindle became the first lay principal of Queen of Peace School, and the parish established the School Endowment Fund. After 30 years of faithful service to the school, the Dominican Sisters departed from OLQP due to thinned ranks, and the convent became the Parish Center. Fr. Erbe served Queen of Peace for nearly a quarter century. During that time, he successfully guided the parish through liturgical and theological changes. Father Kenneth J. Fiedler succeeded Fr. Erbe on June 10, 1993. Fr. Fiedler organized a parish Long-Range Planning Task Force, which studied the parish’s long-term needs. This study ultimately led to the announcement of a $4 million proposed building and renovation project in early 1995, which broke ground in October 1995. The plan called for more seating in the church, a gathering space, a remodeled sanctuary, and an enlarged Eucharistic chapel. In May 1995, the priests moved into houses purchased by the parish. The Parish Center was relocated from the old convent, which was removed to make way for a new gymnasium, to the former Rectory. An enlarged school building provided a larger library; meeting facilities; and computer, music, art, and religious education rooms. The old rectory was renovated to include not only parish offices but also the first kindergarten and after-school day care. Bishop William Bullock rededicated the church to the worship of the Lord on August 25, 1996, and the remainder of the project was complete later that fall. On February 24, 2004, parish staff temporarily moved into the school while the Parish Center was gutted and received a two-story addition on the northeast side. The new Parish Center features an open reception and waiting area, five meeting rooms of various sizes, a larger work room, and office space for staff. December 12, 2005, marked the 60th anniversary of the founding of Our Lady Queen of Peace Parish. In 2009, parishioners again came through with support to make needed repairs, maintenance, and updates to the aging buildings throughout the campus. Church and school roof leaks, spire, and foundation were all repaired; some windows were replaced; and the church auditorium and school lunch room was remodeled to include a multipurpose room acoustically designed for choir and band programs. On June 5, 2009, OLQP Parish offered to assume primary responsibility for the operation of the Catholic Multicultural Center (CMC) on the south side of Madison, which the Diocese of Madison had closed abruptly the previous month due to budget cuts. An outpouring of support from Queen of Peace parishioners, other Diocesan parishes, and the community at large allowed this to occur. On August 3, the center reopened, offering a food pantry, free meal programs, health programs, and English as a second language classes. The free meal program expanded to seven days a week the following year. Queen of Peace School celebrated its 60th anniversary in October 2009, with alumni traveling from as far away as Germany to reconnect, reflect, and celebrate with former classmates and current students. The celebration fueled an interest in an alumni association, and the Pastoral Council approved the formation of the Queen of Peace Alumni Organization in June of 2010. The QPAO represents the interests of alumni, promotes and supports QP School, and strengthens relationships among past, present, and future students of the school and the parish community. Today, Queen of Peace Parish is the spiritual home to over 2,800 families. Almighty God has abundantly blessed Our Lady Queen of Peace Parish. Our parishioners give generously of their time, talents, and financial resources to build a parish community where we serve, give, and receive according to our needs, in the name of Our Lord. The Queen of Peace spirit, tradition, and dedication are firmly established, and with God’s help and blessings, the parish will continue to serve future generations.